The intelligent Konecranes CXT hoist concept combines space efficiency with high reliability and promises a long service life. 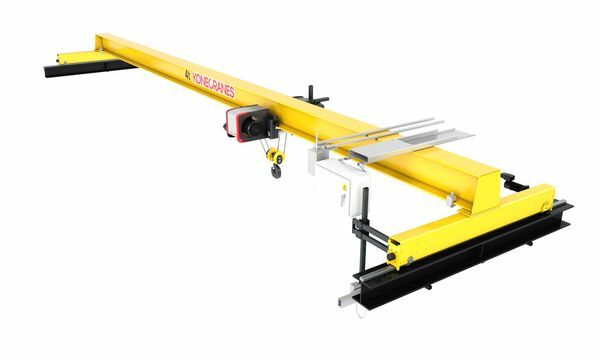 The CXT crane features an especially compact and robust design — equipped with extremely low headroom and small-end approaches — that is suitable for almost every application. Its compact size and strength makes it an indispensable partner in all lifting needs. Furthermore, thanks to its advanced technology and innovative features, the CXT crane is tailored to suit the different needs of customers. Standard CXT cranes can be implemented with single-girder or double-girder construction, a fixed single-girder system (monorail), or with under-running construction. CXT trolley models are available for single girder cranes with low headroom (up to 12.5tons) or normal headroom (up to 40tons), as well as for double girder trolleys (up to 80tons). With different trolley configurations, the most common one is with two or even three trolleys on the same crane, CXT wire rope hoist cranes maximise the lifting height and easily fit into different building types. Konecranes CXT cranes are indispensable in an assembly workshop or industrial plant. With the latest technology for improved load accuracy, versatility, and ease of use, the CXT crane is the industry leader in medium-heavy indoor cranes. CXT hoist platform is also available for hazardous environment. CXT Ex-Proof is designed to ensure the highest safety level required for explosive atmospheres in many chemical and petrochemical plants, oil refineries, gas power plants, waste water treatment plants, and other hazardous areas. “Our CXT hoist platform, cranes and hoists, provide reliable and safe lifting solutions for hazardous environments”, says Benoit Vanhersecke Sales Director Konecranes Middle East. Production facilities have many critical operations that need to be under constant control to be successful: materials coming in, parts being moved around, and finished products going out. One of those operations is, for example, material handling with cranes. Cranes and employees make up a combination that must operate as smoothly, as safely, and as fast as possible. Based on extensive experience, and backed by a thorough understanding of a customer’s processes, Konecranes developed Smart Features: software-based intelligence that saves time and increases the productivity and safety of the crane in the specified application. Depending on the customer needs, CXT cranes can be equipped with standard features and with Smart Features. With the Smart Features developed by Konecranes, the work cycle is substantially shorter. An experienced operator can operate any crane fast, and almost anybody can operate an intelligent crane fast and precisely. The intelligent assisting features help to make almost anyone a good crane operator. It speeds up load handling and offers unprecedented safety characteristics. The advanced functionalities, like sway control, positioning, and protected area functions, enable fast and safe load transfer, even when the operator is not a seasoned professional. A wide range of Smart Features are available: Sway Control, Positioning, Protected Areas, Shock Load Prevention, Inching, Microspeed, Working Limits, Synchro, etc. Additional innovative features developed by Konecranes are the frequency converters ASR (Adaptive Speed Range/Adaptive hoisting speed) and ESR (Extended Speed Range/Extended hoisting speed); the hoisting speed is adjusted automatically according to the current load of the wire rope hoist — the hoisting speed is faster with lighter loads than with heavier loads. In practice, this means faster operation with light loads and safe and gentle operation with heavy loads. Since lighter industrial cranes still mostly use conventional control, with only two-speed hoisting in the ratio of 4:1 or 6:1, the engineers at Konecranes have gone a step further when developing these frequency converters. The convenient ASR technology provides stepless control of the hoisting speed in the ratio of 10:1. Whereas, the ESR technology offers extremely fast hoisting speeds using more powerful engines and providing an extended speed range of up to 37:1. ASR and ESR allow the hoist to run at a higher than nominal rated hoisting speed with light loads. This significantly reduces load cycle and waiting times. 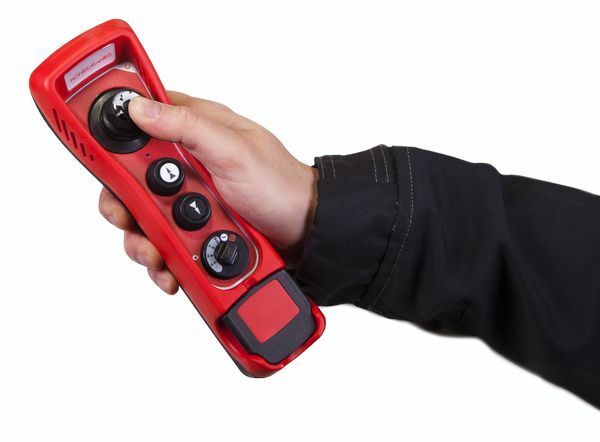 After several studies, and backed by a thorough understanding of the specific customer needs, Konecranes developed a new remote control for the CXT cranes, which is more ergonomic and offers one-hand usability. The main requirement was the ergonomics: creating a radio transmitter that is usable with one hand led to the use of a joystick element, which controls the crane’s travelling movements. 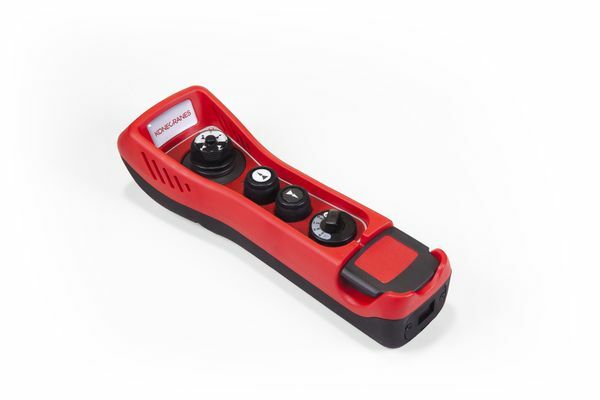 The new MiniJoystick for CXT cranes offers ergonomic benefits. It is also intuitive to operate, allowing users to control the load with just a single grip, to safely move and precisely place heavy loads.